Community colleges play a critical role in higher education for over half of today’s post-secondary students. These institutions serve everyone — from the high school student seeking college-level coursework to the lifelong learner taking a foreign language class to prepare for their next vacation overseas. In between these bookends, community colleges serve as both a destination for those seeking a path to an associate’s degree or vocational certificate, and as a bridge for those looking to transfer to or gain credits for a four-year institution. Although community colleges serve such an important purpose for our communities, they operate against the backdrop of declining enrollment and severe financial constraints with an increased demand for outcomes, typically in the form of employment or completion rates. To navigate these challenges, many community colleges have started rethinking the student experience and implementing one-stop shops and other services to better serve their students. In addition to campuswide structure and process enhancements, community colleges are implementing customer relationship management (CRM) solutions now more than ever before to put students first. 1. Improve recruitment and retention by targeting engagement based on a student’s educational goals. If your community college is looking to implement a full student lifecycle CRM, start here. By hosting inquiry forms, virtual or on-campus events, and admissions applications through a CRM, your school can collect crucial information about prospects and students that will help you send targeted communications. For instance, you can segment different messages and reminders to current students and prospects — a student looking to transfer to a four-year institution might be interested in different campus events than a lifelong learning student. 2. Track results and outcomes across the student lifecycle based on each student’s individual goals and needs. Once educational goals are captured, a community college can start setting criteria for overall success. While term-to-term persistence may be a measure of success for one type of student, it might not make sense for all of your students. Just like tracking degree completion would be appropriate for those seeking a degree, but not for those attempting to supplement their coursework at a four-year institution. By segmenting your school’s population based on each student’s unique goals, you gain a clearer view of success and where efforts should be leveraged. 3. Engage with students across multiple channels throughout their lifecycle. For many community colleges, the student lifecycle is far from linear. An alumnus today could double as a prospect for a future term, as are transient students who are balancing family and jobs while pursuing a degree. Having a full view of a student’s relationship with your school helps ensure continued engagement and promotes success. Plus, for community colleges, solutions and features for advisors are just as, if not more important than, features for recruiters. A robust CRM that helps facilitate all communication between advisors and students (like appointment-setting, text messaging, and email) can dramatically improve overall engagement. 4. Track and maintain relationships with partner organizations that are affiliated with your students, including community-based organizations and employers. Due to the various populations and objectives that a community college serves, there are numerous relationships with outside organizations that are important for student success. These include relationships with feeder high schools, employers, or even community-based organizations that your school partners with to support students. Implementing a CRM can help your community college track contacts and view the relationships that each of these outside organizations have with your students. 5. Promote a genuine sense of community among students, even when most of your population commutes or attends online. Most community colleges are unable to provide the same type of community and opportunities for engagement that traditional live-in institutions can provide — despite the word “community” being in their name! This is why schools with nontraditional students have taken advantage of virtual communities, like Schools App, to provide a dedicated space for students to connect with each other. In fact, Schools App was funded by the Gates Foundation to help promote student success, specifically at community colleges and other schools with nontraditional students. Not only has this app shown to promote retention, but it also provides community colleges with important administrative tools to receive real-time summaries of key conversation themes, post announcements, and send push notifications to students’ smartphones. Best of all, any interaction or activity done in Schools App appears on the student’s record in your CRM for additional insight. Again, if your community college is looking to take a leap of faith and implement a new CRM, make sure that solution is relevant to your processes. There are many higher ed CRM solutions available today that are only designed with traditional and selective four-year schools in mind. All in all, a comprehensive CRM should meet the unique needs of community colleges and provide solutions that support all phases of a student’s lifecycle. Community colleges serve multiple populations with non-linear paths to success. Make sure your CRM can address this and is not solely traditional admissions-driven. For community colleges, solutions for current student advisors and success coaches are just as important as features for recruiters. Your CRM should support engagement with current students across all scenarios, including walk-in appointments, one-off meetings, and other ways staff engage with students. A student typically has multiple relationships with a community college simultaneously. Since a student can be an alum, current student, employee, and prospect all at the same time, ensure your CRM can support complex relationships. Most community colleges lack dedicated resources to implement, support, and fully adopt a CRM solution. And great features aren’t helpful if they can’t be fully adopted. Make sure the CRM vendor you decide to partner with provides adequate support before, during, and after your implementation to ensure maximum ROI. 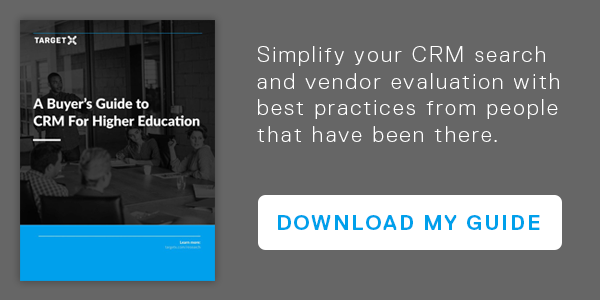 For more tips and best practices, check out our CRM Buyer’s Guide for Higher Ed! Newer Is Email Dead or Did College Admissions Kill It? Older 60 Years and Tens of Millions of Dollars Spent on Student Success, with Little Progress Achieved. Why?